At the heart of Imitation of Life is Bea Pullman's (Claudette Colbert) journey from rags-to-riches. With the help of Aunt Delilah's (Louise Beavers) pancake recipe, Bea builds a business to support herself, her daughter Jessie (Rochelle Hudson), Aunt Delilah, and Delilah's daughter, Peola. The pancake business storyline is not in the 1959 remake of Imitation of Life. It would have been outdated and inappropriate because of the aunt Jemimah-like images of Delilah and her stubborn rejection of part of the profits from the sales. 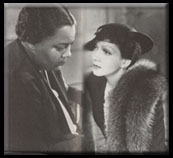 However in the 1934 version of the film, the business partnership (albeit unequal) was important because it demonstrated Delilah's loyalty to Bea. When Bea tries to give Delilah 20% of the profits for her family recipe (and for cooking the pancakes), Delilah rejects her offer. Bea: "You'll have your own car. You own house." Delilah: :My own house? You gonna send me away, Miss Bea? I can't live with you? Oh, honey chile, please don't send me away." Delilah: :How I gonna take care of you and Miss Jessie if I ain't here? I'se your cook. And I want to stay your cook. I gives it to you (the pancake recipe), honey. I makes you a present of it." The fact that the recipe is Delilah's family secret is stated numerous times throughout the film. 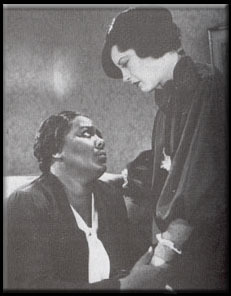 If black pride was a lesson in this film (as it is in Micheaux's films about passing), her decision to sell a piece of her family history to a white woman for profit and to work for a white woman for the rest of her life also would have contradicted that message, but for a mainstream audience in the 1930s, Imitation of Life provided the right answers -- loyalty between the races (especially from the black characters), selflessness, blacks accepting their place, the commodification of black culture, and hard work. Through hard work, intelligent business deals, and determination, Bea uses Delilah's family pancake recipe to open a store, and create her own pancake mix brand. While she is building her business, Bea develops a relationshp with Delilah, and together, they raise their daughters. The relationships between mothers and daughters constitute the central plot of this film. From the beginning of the first scene of the film, a close-up of Bea bathing toddler Jessie, and Jessie begging her mother to let her stay home so that they can spend time together, it is clear that the focus of the film will be on the relationships between mothers and daughters. When Bea explains that Jessie must go to school since she cannot afford to miss work, societal factors (namely money) are represented as a negative influence on the "natural" relationship between parent and child. This theme is repeated in the relationship between Delilah and Peola, only in their case, the societal factor is racism. 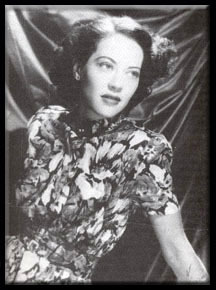 Peola, played by Fredi Washington, is the movie's "single subversive element" (Bogle, 59). Peola, Delilah's daughter, is very light-skinned and spends her life wanting to be white. By refusing to play the stereotypical black role (i.e. like her mother Delilah), and proclaiming her own race, based on how she sees herself (and chooses to be seen), Peola rejects the limitations placed on her by society's treatment of blackness. In all early passing films, that blackness is rejected at least three times: by racism in American culture, by the passing character's abandonment of her mother, and by a self inflicted removal from the black community. In another scene, in response to Jessie calling Peola black, Peola runs into the house crying, "I'm not black. I'm not black. I won't be black". Unintentionally (and perhaps missed by many audience members), when Bea reprimands her daughter, she actually supports Peola argument that being black is bad. Bea tells Jessie, "Jessie Pullman, for shame on you... how could you say such a mean, cruel thing to Peola?" 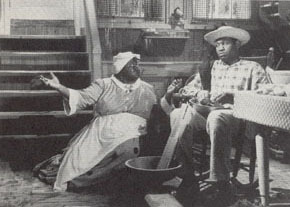 Delilah refuses to allow Jessie to apologize to Peola, and advises Peola to "learn to take it". This interaction reinforces ideas about race that existed during this period. 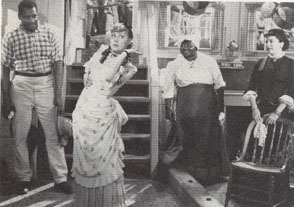 This scene also contains the only fight between Peola and Jessie (suggesting that if Peola knew her place they would not fight -- Bea and Delilah do not have one argument in the film), and is the first time the audience watches Peola's humiliation (she is humiliated again when her mother finds her passing in another town and when she blames herself for her mother's death).